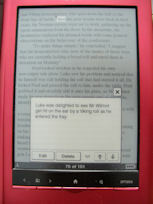 I’m enjoying my ereader very much – it’s such a comfortable and easy way to read. One way I’m using it which I hadn’t anticipated is as an editing device. I’m slowly working on The Viking and the Vendetta, when I have time. I’ve written about half the book, so far. The other week, I converted the Word file into epub format and started to read the work-in-progress on my ereader. I soon found that it was much more pleasurable than trying to read the book on a computer screen (as is the case with every other ebook, so of course it was!). The ability to make notes on the ereader makes it even more useful. When I notice something that needs changing, I can insert a note and then, when I’m back at the computer, I can go through the file, note by note, and make the alterations to the master Word document. The limitations of the stylus and on-screen keyboard mean that I won’t be making major additions to the book using this method, but it is great as a line-editing device. It’s interesting that having an ereader is changing the way I write as well as the way I read!